Its been a horrible cold, wet, nasty day today, with light traces of snow and lots of rain. I had an inventor come this morning to discuss a new project he has in mind, and after he left I turned two valve cages and two valve spring retainers. I dug around in my box of assorted springs and found two springs the right diameter, but I'm not sure at this point if they are strong enough. 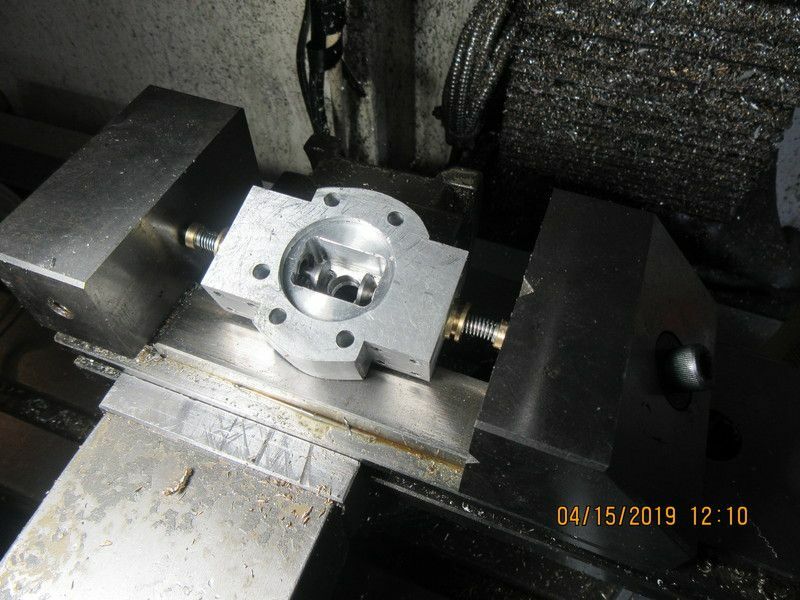 Tomorrow I will use my George Britnel valve seat cutting tool to cut the seats into the cages, cross drill the end of the valves for a retainer pin, lap the valves into their respective seats, and maybe press the assembled valves and cages into the cylinder head. Brian, the speed you are progressing on this amazes me. I been following your posts ever since I logged on to this site. I enjoy watching you do what I want to do, I got too many Honey-do's to get by to keep up with you. 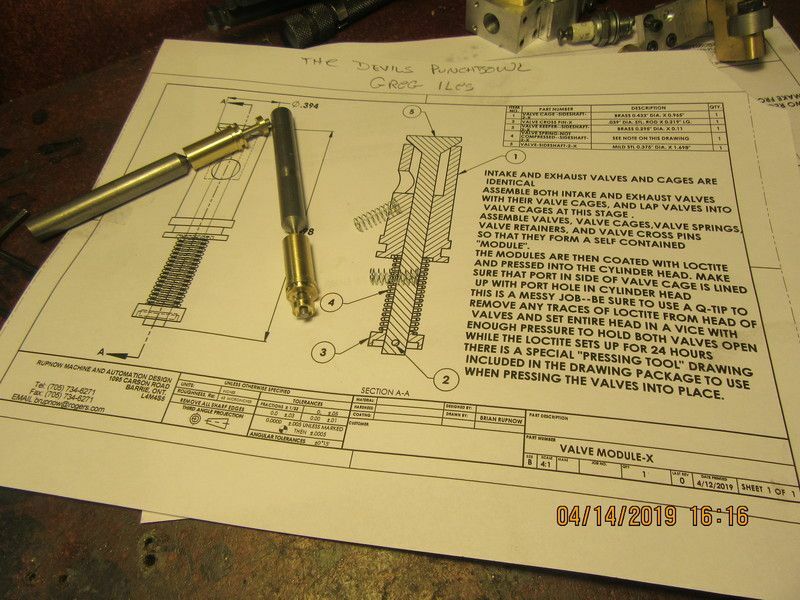 I see you are again using the valve body assembly, i'm flattered you found this idea workable and refined it. The valve modules have been completely finished. All appropriate holes have been added and the valves have been shortened to finished length and lapped into the seats before the modules are pressed into place. The valve cages were coated on the outside diameter with #638 Loctite before being pressed. The valves shouldn't have to be lapped any more, but if they need to be I can remove the spring and retainer and attach one of my finger chucks to the valve stem to spin it for a re-lap. The cylinder head is currently in a vice, which is closed enough to raise the valve faces up of the seats. That is "just in case" I may have got some Loctite on the valve faces. I don't want to Loctite the valve faces to the seats. Last edited by brian Rupnow; 04-15-2019 at 01:02 PM. I knew that sooner or later I was going to have to cut keyways in this crankshaft, and today was the day. These keyways are just a little bit different, because they don't run out to the end of a shaft. I thought that they were called "pocket" keyways, but they are actually called "feather" keyways. I had to go across town and buy a couple of new 3/32" endmills because the one I had was broken. Not being able to find any pertinent information other than the correct name, I made it up as I went along. 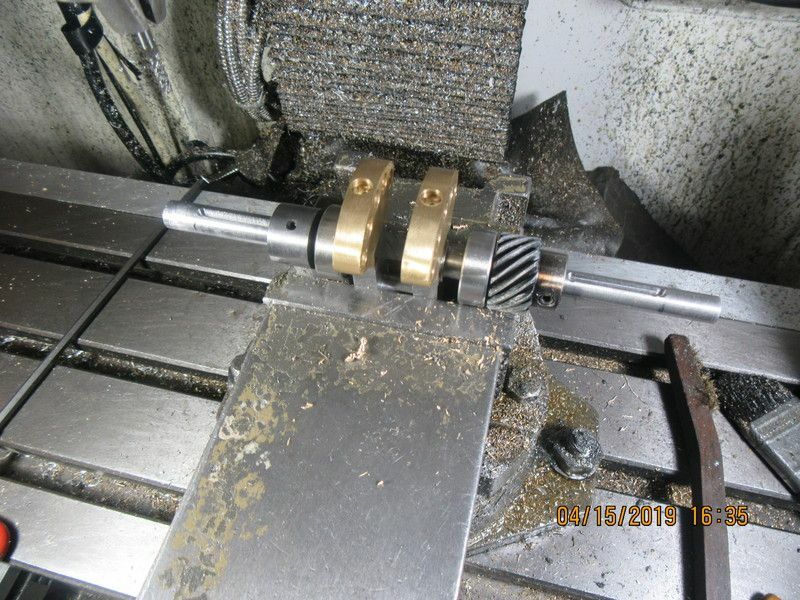 I ran the mill at 1150 rpm, poised the endmill over what would be the extreme end of the keyway, then very cautiously plunged to full depth--which in my case was about 0.053". This went well, so after plunging a total of four places I increased the depth from "0" to 0.053" in .005" increments and moved the table in x axis very slowly and cautiously from one end of the keyway to the other, with lots of squirt on cutting oil. All went well, I didn't break the endmill, and I have my keyways finished. I am still waiting for my broach to arrive so I can cut the keyways in my flywheels. My broach came in today, but there was a problem. The one I ordered was a plain HSS broach, for $75 Canadian. The one that came in today was the right size but was TIN coated and costs $135 Canadian. Tomorrow will be negotiation time. I am not going to pay $135 but I don't want to wait for another two weeks to get an uncoated broach in. Apparently they come from some place in Virginia. The engine is very close to being finished. This morning I am "running it in" with power provided by an old 1/2 hp. electric motor. Running an engine in is not intended to take out any major binding in an engine. That is something that has to be addressed with more machining on something. This type of run in is to address all the minor binding points.--Con-rod big end to crank journal, sideshaft to bushings, wrist pin to piston, and any "stickiness" in the valve train. I think you would be correct to call what you have cut a pocket or profile keyway. A keyway cut with a Woodruff or similar cutter (moving along the shaft rather than plunge cutting) has been called a sled runner keyway, I don't know how common that term is. But a feather KEY is one that allows a hub to slide along the shaft. I suppose a keyway long enough to accommodate a feather key might be called a feather keyway. I'm open to correction by those who know better. Last edited by cameron; 04-16-2019 at 11:29 AM. Brian, Faires "Design of Machine Elements" Defines "feather key" and shows two types, one where the key is fixed in the shaft and the hub slides on the key, and the other where the key is fixed in the hub and slides in the keyway. It also uses the terms profile keyway and sled runner keyway (or possibly sled runner keyway ending, I can't find the reference at the moment). Merriman-Webster's definition agrees with Faires. Google turns up at least one other dictionary with a similar definition. However, general language dictionaries are unreliable in regard to technical terms, in my experience. And Faires, which I regard as a very good text on machine design, dates back to the early days of the first industrial revolution, way back when I was in university, and can not be regarded as an unimpeachable authority on modern machine shop nomenclature. Google hits suggest that any ordinary round ended key can now be called, and advertised and sold, as a "feather key". Just another example of the continuing debasement of the language, IMO, where a once useful and specific term becomes misused and meaningless. Last edited by cameron; 04-16-2019 at 01:48 PM.